Tropics3, Zones4, and Meridian Lines5?" And that was to tingle6 his bell. When he cried "Steer to starboard, but keep her head larboard7!" We have never beheld till14 now! With a flavour of Will-o'-the-wisp17. 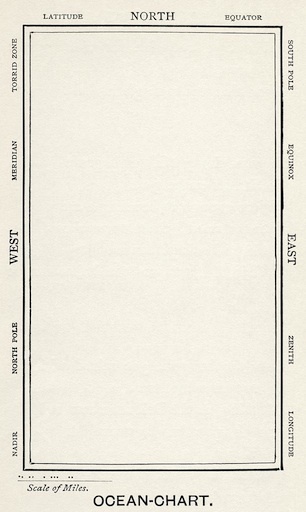 Practically speaking a map with land masses wouldn't be much use to a sailing ship once land masses were out of sight. In those conditions sailors needed extra help, and today there are actually sea current maps and the like, quite apart from GPS. However, such things weren't available until very recently. Before it was possible to accurately calculate longitude, seafaring maps included major land masses marked with key parts and what were called "rhumb lines" between them. If a ship kept sailing along the correct heading as indicated by the rhomb line, in due time the ship's crew could expect to arrive at the part on its other end. The official desire to "explore" the world made this methodology less and less desirable, driving development of time pieces that would be accurate at sea, which in turn facilitated longitude calculations. "Mercator" being the inventor of the famous, or infamous, depending on your point of view, map projection that makes greenland look ridiculously large, africa ridiculously small, and antarctica like it must be bigger than the whole Earth. There was nothing intentional or political behind this in an overt sense. Mercator's projection was never intended to give a realistic sense of the relative sizes of different islands and continents. It's a cylindrical projection intended to make the rhumb lines mentioned above easier to represent. So while it is great for maintaining the right angles and sizes in small areas not too far from the equator, the distortion increases steadily to infinity at the poles. That's why antarctica spans the entire bottom of a mercator projection map. The "tropics" are the celestial latitudes at which the Sun appears "to turn" at the solstices. So when you observe the summer or winter solstice, when the Sun seems to stand still in the sky for three or four days, the place it seems to stand is on the tropic line for your hemisphere. The "zones" referred to here would usually be the "zones of latitude" which are important because they roughly correspond to weather system bands that dictate prevailing winds. Prevailing winds remain an important issue for motorized ships, since the effect of the wind on such ship's headings can still be significant, especially if they are large. A good analogy for the effect on steering is that of strong wind gusts on a car when driving down the highway. Meridian lines are lines of constant longitude running from north to south (or south to north if you are from the southern hemisphere). The word "meridian" derives from latin for "middle of the day, noon" and a meridian line may be defined by marking where the Sun passes overhead at noon. "Tingle" is an interesting verb choice here. In north american english the verb would be "tinkle" which is really the same word with a slightly different spelling probably dictated by change in pronunciation. "Tinkling" something creates an externally heard sound, while "tingling" is an internally felt sensation. The OED suggests the connection lies between the potential response of someone hearing a sudden clamouring noise. Larboard is a real word, and refers to the port or left hand side of a boat. However, starboard means the right hand side, from old english steorboard, that is the side you steer on. Larboard was originally lade-board, the side cargo was loaded and unloaded from (a bill of lading is literally a bill of loading in modern english). It would make sense for larboard to fall out of use with sailors since it sounds too much like starboard to avoid mishaps in bad noise conditions. However, it really need never have been sailors' terminology at all. It could easily have been stevedore's terminology instead, in which case it would be a term you'd almost never actually hear at sea. In any case, if a steersman were to follow the Bellman's directions, the ship would end up going in circles at best. Carroll's usage of "snarked" here seems so close to the less genteel and more contemporary "screwed" the reader is left to wonder if he had his tongue firmly planted in cheek. The Bellman's lack of experience at sea is probably shown up worst of all with this lament. The wind direction is where a wind blows from; the wind's heading is where it is blowing to. The storms referred to as westerlies come from the west, so the west if the direction of the storm. If you run from the west, the direction you are moving in east, which does make sense as long as you bear in mind the way winds used to be mnemonically represented in the corners of maps: as wind deities blowing from their directions of origin. The ship's sails must be turned in order to catch the wind, so if the wind is blowing from the west this is the direction the sails must be, and the ship will be pushed east. If a wind is blowing "due" a given compass point, it is blowing towards that point, so to blow due north is the same as a north heading. Not being a sailor either, I sympathize with the Bellman's frustration. But now we have a ship being blown by a wind heading to the east, while the ship heads to the west. This would be perverse given what I've just written, especially if I haven't managed to get the various directions inverted in spite of checking my sources twice. However, if the ship's bowsprit is on the stern instead of the bow, and the Bellman depends on where the bowsprit is to understand which way the ship is moving, then his confusion makes hilarious sense. On open water, the mistake would be easy to make. On the other hand, since the Earth is round, if a ship sails far enough on an eastern heading, the ship will be sailing west again after passing around the circumference of the Earth. A portmanteau is officially a sort of big leather suitcase with two equal-sized halves. My electronic OED traces the parts of the word to the french words for "carry" and "cloak" respectively. The cloak connection is a bit puzzling at first glance, but seems to come from the ancient practice of tying up belongings in a (hopefully) spare cloak preparatory to travelling. The two halves feature is key, as Carroll's later definition of "portmanteau" words makes clear. Grog is diluted rum, originally with lemon juice and water, that was once regularly served to british sailors. It was originally a genuine necessity, as the sailors needed to drink water, but the water was often tainted. The rum killed the germs and hid foul taste. Sailors were also prone to scurvy when at sea for long periods, since tehy couldn't get fresh fruit. The lemon juice portion of their grog helped with that. "Bade" is the past tense of "to bid", but like "deem" the past tense of "to doom" (meaning "to judge") is almost gone from spoken english except in formulaic statements. This Shakespeare quote is, as many readers will know, from Julius Caesar, line 1617, spoken by Antony at the beginning of one of his major speeches in the play. I can't take credit for tracking it down so specifically, that credit belongs to the website Open Source Shakespeare. The Bellman's use of "till" here is a bit strange to modern ears, since it is the same word as "until" and now tends to lead us to expect that whatever hasn't happened until the moment referred to just has. However, the way we'd say the phrase now would likely be, "Up to now we have not seen a Snark." To be warranted is the same as to be guaranteed. The synonymy is no coincidence, and came about because english took in the same word twice, one time each from two different dialects of french. The first time it came from norman french, the dialect spoken by the norman invaders of france who settled in normandy, but were not so settled as to resist the idea of invading england after establishing a firm hold in france. The second time it came from something like the parisian dialect of french, whose speakers had no "w" and so replaced it with a number of different sound combinations including "gu" as in guarantee, "ou" as in "oui" (yes), and "oi" as in "oiseaux" (bird). These adjectives do not generally apply to taste, and in their perverse inapplicability add an appropriately off-centre quality to the Bellman's description of the Snark. A will-o'-the-wisp is a hard or impossible to catch flame or even ghost, strongly associated with swamps and other places where marsh gases can spontaneously combust into short lived flickers of light and flame. They were reputed to lead the unwary traveller deeper and deeper into a swamp until they became hopelessly lost or fell into the muck and drowned. In an ordinary day in Lewis Carroll's time, breakfast would be between 07:00 and 09:00, dinner (north american lunch) between 12:00 and 13:30, five o'clock tea between its name hour and 19:00, and supper between 18:30 and 21:00. So if the Snark has breakfast when everybody else has five o'clock tea, then to have dinner at the correct hour it must of course have it the following day: after midnight! In this the Snark is quite like the giant gnat Alice encounters during her adventures through the looking-glass. For a proper description and discussion of bathing machines, the best place to look on this site is at the annotated Alice's Adventures in Wonderland. Originally "ambition" could indeed be a mark. In ancient rome, a man seeking office would go walking about to round up votes and support. The word for "to walk (around)" was ambire, which was reshaped in french to the form now enshrined in the english word ambition. However, there were all sorts of men busy walking about in ancient rome, in part because clients were expected to call at the houses of their patrons. So to differentiate themselves from such individuals, men seeking office, candidates, would wear a candida  white  toga. A regular client might wear a toga or tunic of any colour. "Hunting of the Snark: An Agony in Eight Fits"